“By observing in detail the myriads of stars surrounding the centre of the Milky Way we can learn a lot more about the formation and evolution of not only our galaxy, but also spiral galaxies in general,” explains Roberto Saito (Pontificia Universidad Católica de Chile, Universidad de Valparaíso and The Milky Way Millennium Nucleus, Chile), lead author of the study. Most spiral galaxies, including our home galaxy the Milky Way, have a large concentration of ancient stars surrounding the centre that astronomers call the bulge. Understanding the formation and evolution of the Milky Way’s bulge is vital for understanding the galaxy as a whole. However, obtaining detailed observations of this region is not an easy task. The large mirror, wide field of view and very sensitive infrared detectors of ESO’s 4.1-metre Visible and Infrared Survey Telescope for Astronomy (VISTA) make it by far the best tool for this job. 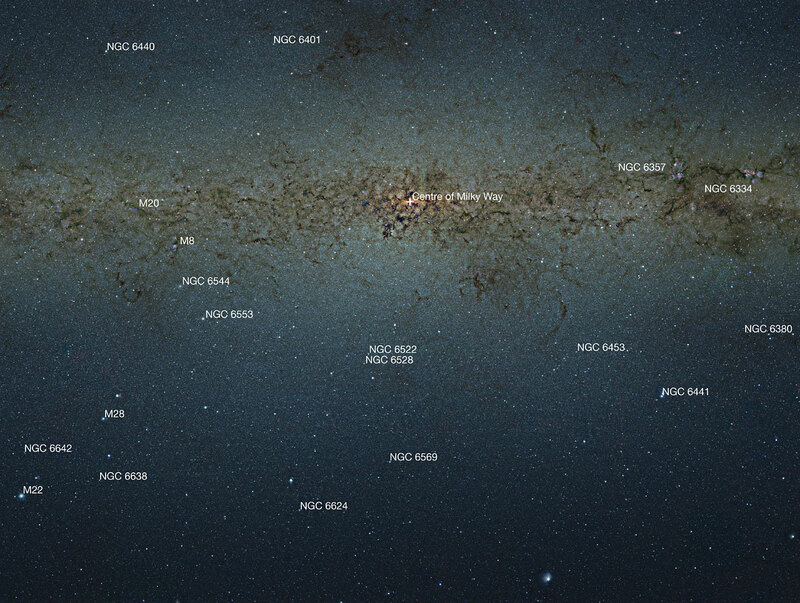 The team of astronomers is using data from the VISTA Variables in the Via Lactea programme (VVV) , one of six public surveys carried out with VISTA. The data have been used to create a monumental 108 200 by 81 500 pixel colour image containing nearly nine billion pixels. This is one of the biggest astronomical images ever produced. The team has now used these data to compile the largest catalogue of the central concentration of stars in the Milky Way ever created . To help analyse this huge catalogue the brightness of each star is plotted against its colour for about 84 million stars to create a colour–magnitude diagram. This plot contains more than ten times more stars than any previous study and it is the first time that this has been done for the entire bulge. 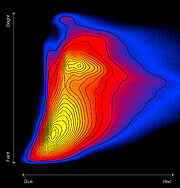 Colour–magnitude diagrams are very valuable tools that are often used by astronomers to study the different physical properties of stars such as their temperatures, masses and ages . The new colour–magnitude diagram of the bulge contains a treasure trove of information about the structure and content of the Milky Way. One interesting result revealed in the new data is the large number of faint red dwarf stars. These are prime candidates around which to search for small exoplanets using the transit method . “One of the other great things about the VVV survey is that it’s one of the ESO VISTA public surveys. This means that we’re making all the data publicly available through the ESO data archive, so we expect many other exciting results to come out of this great resource," concludes Roberto Saito. 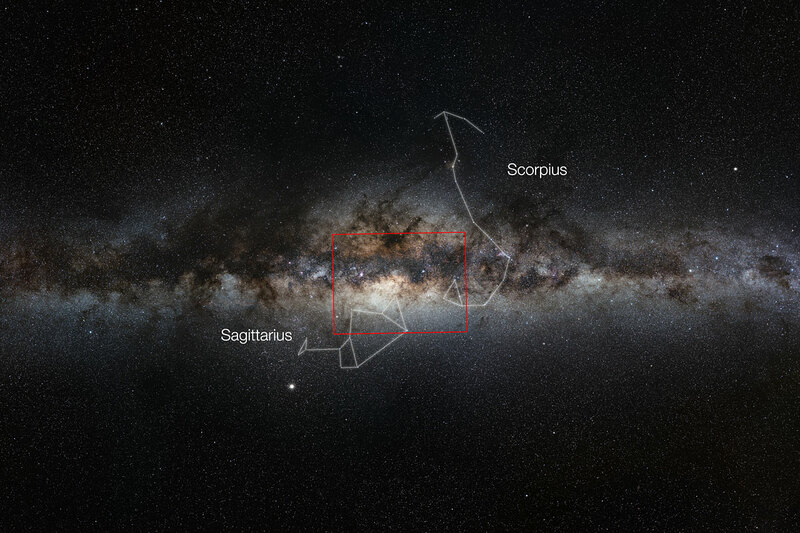 The VISTA Variables in the Via Lactea (VVV) survey is an ESO public survey dedicated to scanning the southern plane and bulge of the Milky Way through five near-infrared filters. It started in 2010 and was granted a total of 1929 hours of observing time over a five-year period. Via Lactea is the Latin name for the Milky Way. 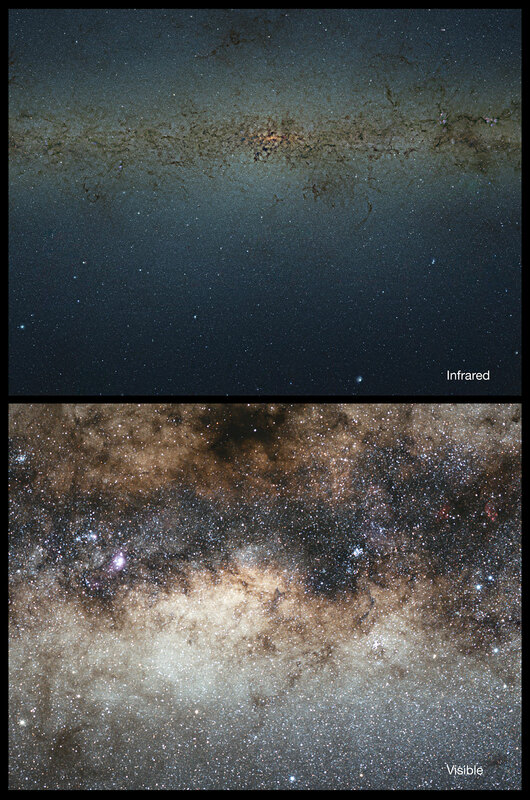 The image used in this work covers about 315 square degrees of the sky (a bit less than 1% of the entire sky) and observations were carried out using three different infrared filters. The catalogue lists the positions of the stars along with their measured brightnesses through the different filters. It contains about 173 million objects, of which about 84 million have been confirmed as stars. The other objects were either too faint or blended with their neighbours or affected by other artefacts, so that accurate measurements were not possible. Others were extended objects such as distant galaxies. The image used here required a huge amount of data processing, which was performed by Ignacio Toledo at the ALMA OSF. It corresponds to a pixel scale of 0.6 arcseconds per pixel, down-sampled from the original pixel scale of 0.34 arcseconds per pixel. A colour–magnitude diagram is a graph that plots the apparent brightnesses of a set of objects against their colours. The colour is measured by comparing how bright objects look through different filters. It is similar to a Hertzsprung-Russell (HR) diagram but the latter plots luminosity (or absolute magnitude) rather than just apparent brightness and a knowledge of the distances of the stars plotted is also needed. The transit method for finding planets searches for the small drop in brightness of a star that occurs when a planet passes in front of it and blocks some of its light. The small size of the red dwarf stars, typically with spectral types K and M, gives a greater relative drop in brightness when low-mass planets pass in front of them, making it easier to search for planets around them. This research was presented in a paper “Milky Way Demographics with the VVV Survey I. The 84 Million Star Colour–Magnitude Diagram of the Galactic Bulge“ by R. K. Saito et al., which was published in the journal Astronomy & Astrophysics (A&A, 544, A147). The team is composed of R. K. Saito (Pontificia Universidad Católica de Chile, Santiago, Chile; Universidad de Valparaíso, Chile; The Milky Way Millennium Nucleus, Chile), D. Minniti (Pontificia Universidad Católica de Chile; Vatican Observatory), B. Dias (Universidade de São Paulo, Brazil), M. Hempel (Pontificia Universidad Católica de Chile), M. Rejkuba (ESO, Garching, Germany), J. Alonso-García (Pontificia Universidad Católica de Chile), B. Barbuy (Universidade de São Paulo), M. Catelan (Pontificia Universidad Católica de Chile), J. P. Emerson (Queen Mary University of London, United Kingdom), O. A. Gonzalez (ESO, Garching, Germany), P. W. Lucas (University of Hertfordshire, Hatfield, United Kingdom) and M. Zoccali (Pontificia Universidad Católica de Chile).